For 31 seasons the Minnesota Vikings played inside at the Metrodome in downtown Minneapolis. The 2013 season marked the end of the Metrodome as a new stadium for the Vikings, US Bank Stadium, is constructed on its site. Throughout the 1970s, the Vikings were one of the best teams in NFL and regularly sold out the 48,000 seat Metropolitan Stadium. Due to the deteriorating condition of Metropolitan Stadium, the Vikings began discussing building a new stadium in 1971. Talk of a new stadium for the Vikings continued throughout the decade. The Metropolitan Sports Facilities Commission was formed in 1977 and stadium politics dominated the Minnesota State Legislature the same year. 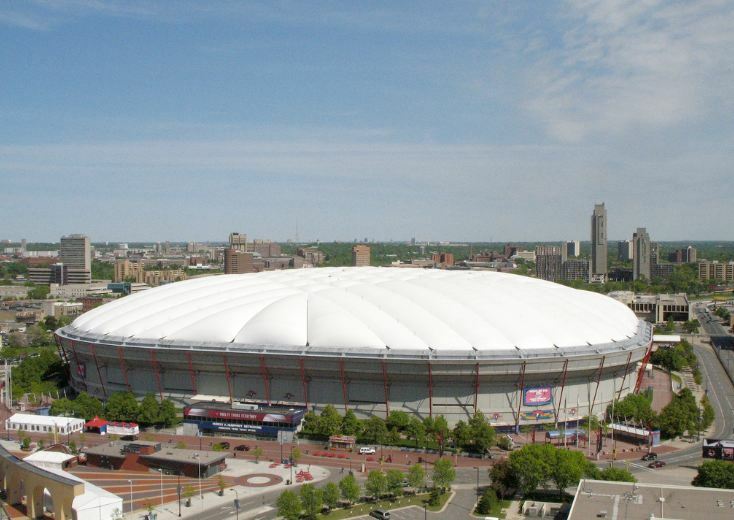 Two years later in 1979, a new dome stadium was approved to be built in downtown Minneapolis. On December 20, 1979, construction began on the multipurpose dome stadium. A dome multipurpose stadium was chosen because of the extreme cold and wintertime weather. Named after former Vice President, Hubert H. Humphrey, the H.H.H. Metrodome, was completed in just over two years. The Minnesota Twins (MLB) played the first game ever at the Metrodome on April 6, 1982. Over 64,000 seats in two tiers circled the entire field when the Metrodome was in football configuration. When the Vikings shared the Metrodome with the Twins, it was one of the easiest stadiums to be converted from baseball to football. The entire process only took around four hours. A section of 7,600 retractable seats formed the 23 foot high right field wall during a baseball game. However, theses seats were pulled out, allowing the capacity to be increased during football games. The dome roof consisted of over ten acres of Teflon-coated fiberglass. It was the only air-supported dome and fans entered the park through revolving doors that prevented the release of air and kept the dome upright. In order to remain inflated, the roof required 250,000 cubic feet of air pressure per minute. The roof had snow melting ducts to prevent a collapse. However, the roof has collapsed four times due to heavy snow, the most recent in December 2010. This caused the Vikings/Giants NFL game to be postponed and moved to Detroit and the Vikings final home game of the season to be moved to TCF Bank Stadium, home of the Minnesota Golden Gophers (NCAA). This game was the Vikings first home game outdoors since playing at Metropolitan Stadium in 1981. Changes at the Metrodome throughout its history include LED Boards, new color replay screens, a new Plaza outside the stadium, new rows of seats behind home plate for baseball, new Terrace Suite, re-construction of all concession stands and new concourse televisions. After the 2003 season, the Astroturf field was removed and replaced with Fieldturf. In 2010 the Minnesota Twins moved into Target Field leaving the Vikings as the primary tenant of the Metrodome. In 2012 the team was able to secure funding to construct a new stadium on the same site as the Metrodome. Construction forced the Metrodome to be demolished and the Vikings to play at TCF Bank Stadium (home of the Minnesota Golden Gophers) during the 2014 and 2015 seasons. 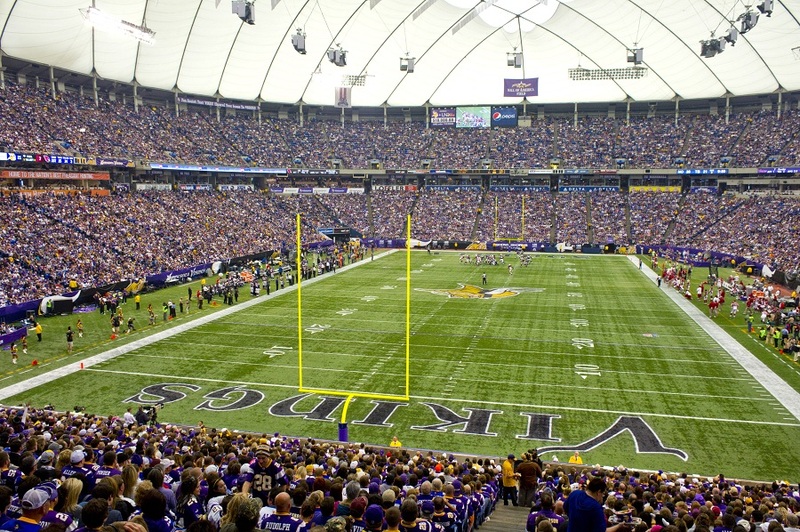 The Minnesota Vikings played their last game at the Metrodome on December 29, 2013, a win against the Detroit Lions. In 2016 the Vikings moved into their new stadium, US Bank Stadium, located at the same location where the Metrodome once was.